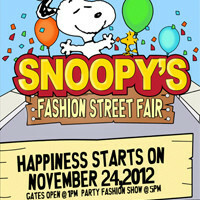 In celebration of Snoopy's 60th year anniversary, Snoopy Fashion Street Fair will be held on November 24, 2012 at the New Glorietta Activity Center. The “SNOOPY’S HOLIDAY STREETFAIR” is a triple celebration because we are launching our Snoopy teens wear and also opening our new Snoopy concept store, Beagle Place! Snoopy was born from the world’s famous comic strip, Peanuts that debuted on October 2, 1950 and made famous by creative genius Charles Schulz. It has already appeared in over 2,600 countries. Snoopy began his life in the strip as a fairly conventional dog, but eventually evolved into perhaps the strip's most dynamic and coolest dog any owner could have. Lucky Charlie Brown, eh? Over the years Snoopy has been a global phenomenon and has even penetrated the world of high fashion. Surely, you could never go out of style with Snoopy! After all designers and major brands worldwide have done breathtaking collaborations with this Cool Joe. Prestigious Japanese brands like Uniqlo and Mercibeaucoup also incorporated Snoopy into their recent collections. We bet your bottom dollar they know a thing or two about style. This year, the very popular game, “Snoopy’s Street Fair”, turns into reality with lots of fun activities in store for everybody. Dress up for the occasion by having your face painted. Try your luck and win lots of prizes from our game booths. Get creative at Woodstock’s Art Corner. Shop the latest pieces from our newest collections at discounted prices. Then after a full day of excitement, quench down at Sally’s refreshing lemonade stand. These and more surprises await you at the fair so be sure to drop by! Join in the festivities! Share the love and happiness among the whole family. Get FREE tickets HERE.